Catalyst Industries formulated Final Sand in 1994 and later received a Patent on it’s formulation. Final Sand is the fastest sanding, cleanest rinsing hand sanding (Matting) paste in the industry. While Final Sand was primarily formulated for use in Blending Applications, it is also excellent for Bumper Prep (and other plastic parts), and as a final clean up before painting. An irreplaceable, top of the line product for the professional auto body paint technician. Quick prep of panels for blending color and clearcoating. Easy prep for sail panel blending. Use anywhere a DA cannot reach. Use FINAL SAND to clean the entire job and ensure that all areas are completely prepped. For convenience and organization around your shop the gun holster provides Easy access to tools and equipment during all stages of the job. Magnetic and Mobile, The Gun Holster provides the Painter with convenient Paint Gun Storage in the Mixing room and can be positioned in the Paint Booth adjacent to the work area providing convenient access to Paint Guns. Place it anywhere in the paint booth. Holds up to Five (5) spray guns. Holds gravity and siphon-feed spray guns. Provides convenient storage for razor blades and tweezers. Keeps tack-cloths close at hand. A must have for any body shop, this one of a kind tool enables any auto body technician to work out minor dents and dings with ease and convenience. Choice of three tools to massage out small to medium size dents. Slips over finger to easily access tight spots. Ergonomically designed for today’s lighter gauged sheet metal. Excellent Finger Dolly for tight places. THE WORLD IS MADE OF PLASTIC “SONIC●BOND” FIXES THE WORLD! Sonic●Bond Adhesive, Rapid Fill, and Sonic●Bond Accelerator combine to become an extremely versatile repair kit for most plastics, metals, ceramics and other non-porous materials. Use as needed to strengthen joints, fill in cracks and chips, or to build missing pieces. 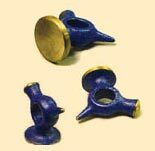 This material cures quickly (4 seconds) and may be sanded, filed, drilled, tapped, painted, etc. Use is limited only by your imagination. Cell Phone Holders, electronics cases, small appliance knobs, …a myriad of houshold uses! Great for most rigid or semi-rigid materials. This is a magnetic spray-out card holder. Adjustable to meet the requirements of all manufacturers card sizes. Holds card to keep paint off painter while spraying and drying. Keeps card on body and off ground or floor while color matching. Must have for every painter. Perfect for buffing those tight spots. Each package contains two sizes of one of 3 styles – Round, Cylinder, and Cone style. Each comes with it’s own 1/4″ arbor. Also great for buffing aluminum wheels. * Always wear safety glasses when using this product. *User assumes all liability for use. By using this product, user agrees to hold Catalyst Industries, Inc. Harmless of any and all damages that may result from use, including unforeseen situations that may occur while in use. Please use common sense when tying down a load. No more messing around trying to find the right shape to block with. No more rolled up newspapers and magazines. No more paint stick sanding blocks. Pro Mold is easy to use and you can create the exact shape you need. Make a spreader (mold) and have 90% of the sanding / blocking done without even sanding! Experiment a little and see how much time you can save. For those difficult, complex stylelines – create a sanding block of the EXACT shape needed to bring the body filler back to the original contour of the vehicle! Use over and over again. You can also create some generic sanding block profiles to keep on hand when an exact shape isn’t needed. This stuff is AWESOME! You can use it for many other purposes too. How about custom shaped socket set holders? Brackets and mounts? Repair a coolant reservoir- geez, make a whole new one! Make prototype parts and molds. We want to hear back from you about your ingenious ideas for other uses and we’ll post them on our website. That way EVERYBODY can benefit! Or, give us a call at 800-667-4068 or 208-667-4066. The phone never rings around here and we’d love to hear from you! And please don’t forget to read the instructions on the package! DON’T GET BURNED – MELTED PLASTIC (EVEN IF ONLY 140 DEGREES) IS HOT! And if you sue us for getting burned, you’ll lose because WE WARNED YOU! We don’t have much money anyway. Be careful out there.